New Cardiovascular Risk Calculator Offers Precision Medicine for People in Midlife | Technology Networks Cardiovascular Risk Predictor Developed for Astronauts: We Can Use it Too! Cardiovascular Risk Predictor Developed for Astronauts: We Can Use it Too! Measuring coronary artery calcium is among the most powerful and novel cardiovascular risk assessment tests. Until now, patients could not easily combine this measurement with traditional risk factors like blood pressure and cholesterol to predict the risk of having a stroke or heart attack. The new tool, named the Astronaut Cardiovascular Health and Risk Modification (Astro-CHARM) calculator, was developed by the National Space Biomedical Research Institute (NSBRI) together with a research team led by UT Southwestern preventive cardiologist Dr. Amit Khera. Its purpose is to facilitate precise cardiovascular risk assessment for astronauts as well as the general population. 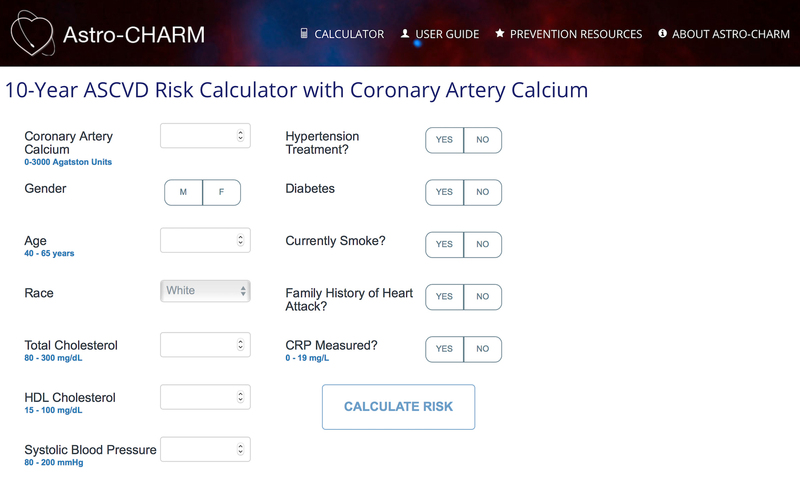 The heart attack and risk calculator was developed by UT Southwestern, NASA, and NSBRI. Dr. Amit Khera is Professor of Internal Medicine and Director of UT Southwestern’s Preventive Cardiology Program. NASA launched the study with UT Southwestern to enhance cardiovascular risk prediction for astronauts, who are predominantly middle-aged men and women. The full study on Astro-CHARM was recently published in Circulation. The Astro-CHARM cardiovascular disease prevention tool can be found at astrocharm.org. According to the Centers for Disease Control and Prevention, heart disease is the leading cause of death for both men and women. About 610,000 people die of heart disease in the United States every year, and many suffer complications from heart attack and stroke. “This study is a perfect example of how NASA (and NSBRI) sponsored research helps both astronauts and the general population on Earth. The study was inspired by a critical question asked by flight surgeons and answered quickly by a partnership with academia,” said senior author and renowned UT Southwestern sports cardiologist Dr. Benjamin Levine. Dr. Levine is Director of the Institute for Exercise and Environmental Medicine at Texas Health Presbyterian Hospital Dallas, and a Professor of Internal Medicine/Cardiology at UT Southwestern, where he holds the Distinguished Professorship in Exercise Sciences. For this study, the following risk factors were self-reported: race/ethnicity, history of cardiovascular diseases, medication usage, family history of myocardial infarction, and smoking status. Height, weight, blood pressure, plasma lipids, body mass index (BMI), and glucose were measured using standard methods. The researchers also looked at the patients’ personal and/or family history of diabetes and myocardial infarction. The mean age of the 7,382 study participants was 51, and the group was 45 percent female and 55 percent nonwhite. Data for this study were pooled from the Multi-Ethnic Study of Atherosclerosis, the Dallas Heart Study, and the Prospective Army Coronary Calcium Project. It was independently validated with the Framingham Heart Study Offspring and Third Generation cohorts. The Dallas Heart Study was initiated in 2000 with the primary goal of improving the diagnosis, prevention, and treatment of heart disease. It is the only single center heart study of its size and multiethnic composition. This article has been republished from materials provided by The University of Texas Southwestern Medical Center. Note: material may have been edited for length and content. For further information, please contact the cited source.